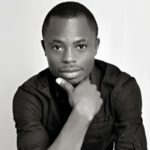 Umar Yogiza Jr. is a writer, poet and engineer based in Abuja, Nigeria. No. 47, Amure Omanza Street, Ladoke Akintola Boulevard, Garki II, Abuja. He is the author of Instrument of Immortality and Singing In A Bonfire. His works have appeared in anthologies, journals and online platforms.